MEP/FP Consultants - Globetrotters Engineering Corp.
Theater Consultant - Schuler Shook Acoustical Consultant: Shiner + Assoc, Inc. Designed to serve 900 students, this 105,000 SF, three-story, steel frame and masonry construction building includes science, computer, music, and art classrooms, in addition to library, gymnasium, kitchen, servery and dining facilities. In 2013, the project was honored with the Chicago Association of Realtors Good Neighbor Award. The L shape design organizes school functions into a classroom wing along the east-west axis and common and staff areas into a wing along the north-south axis. 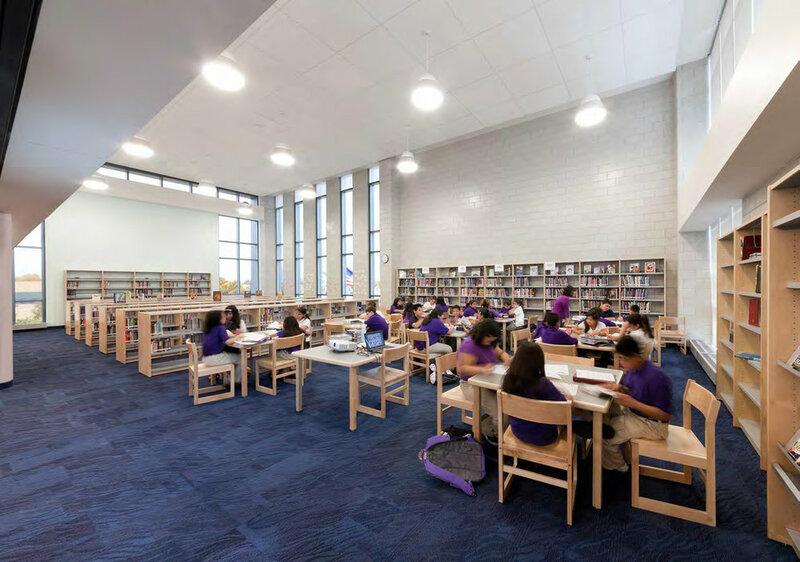 Guided by a mandated minimum silver level certification through design, and actually achieving gold, the project’s sustainable design features include extensive use of natural lighting, green roofs, high performance building envelope components and energy saving building mechanical systems.